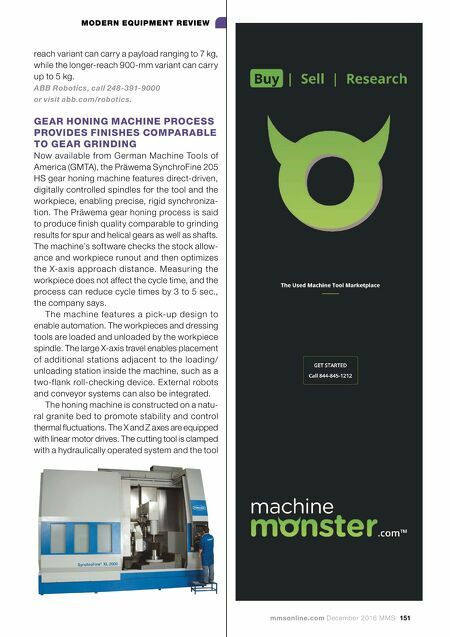 150 MMS December 2016 mmsonline.com MODERN EQUIPMENT REVIEW included for easy automation. Okuma America Corp., call 704-588-7000 or visit okuma.com/americas. 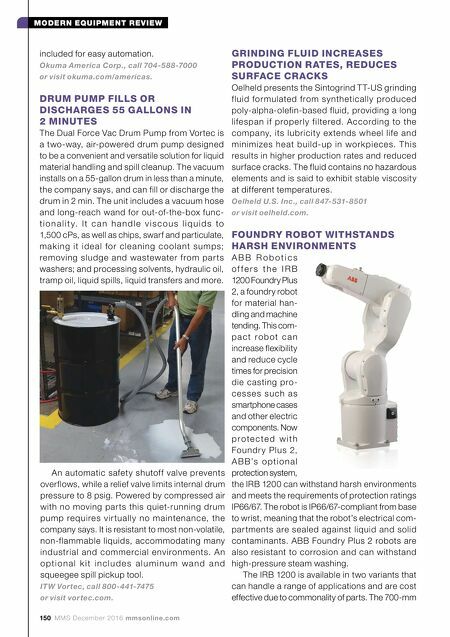 DRUM PUMP FILLS OR DISCHARGES 55 GALLONS IN 2 MINUTES The Dual Force Vac Drum Pump from Vortec is a two-way, air-powered drum pump designed to be a convenient and versatile solution for liquid material handling and spill cleanup. The vacuum installs on a 55-gallon drum in less than a minute, the company says, and can fill or discharge the drum in 2 min. The unit includes a vacuum hose and long-reach wand for out-of-the-box func- t i o n a l i t y. I t c a n h a n d l e v i s c o u s l i q u i d s t o 1,500 cPs, as well as chips, swarf and particulate, m a k ing i t id e a l fo r c l e a ning c o o l a nt su m ps; removing sludge and wastewater from par ts washers; and processing solvents, hydraulic oil, tramp oil, liquid spills, liquid transfers and more. GRINDING FLUID INCREASES PRODUCTION RATES, REDUCES SURFACE CRACKS Oelheld presents the Sintogrind TT-US grinding fluid formulated from synthetically produced poly-alpha-olefin-based fluid, providing a long lifespan if properly filtered. According to the company, its lubricit y ex tends wheel life and minimizes heat build-up in work pieces. T his results in higher production rates and reduced surface cracks. The fluid contains no hazardous elements and is said to exhibit stable viscosity at different temperatures. Oelheld U.S. Inc., call 847-531-8501 or visit oelheld.com. FOUNDRY ROBOT WITHSTANDS HARSH ENVIRONMENTS A B B R o b o t i c s o f f e r s t h e I R B 1200 Foundry Plus 2, a foundry robot for material han- dling and machine tending. This com- p a c t r o b o t c a n increase flexibility and reduce cycle times for precision die casting pro- c e s s e s s u c h a s smartphone cases and other electric components. Now p r o t e c t e d w i t h Foundr y Plus 2, A B B 's o p t i o n a l protection system, the IRB 1200 can withstand harsh environments and meets the requirements of protection ratings IP66/67. The robot is IP66/67-compliant from base to wrist, meaning that the robot's electrical com- par tments are sealed against liquid and solid contaminants. ABB Foundr y Plus 2 robots are also resistant to corrosion and can withstand high-pressure steam washing. The IRB 1200 is available in two variants that can handle a range of applications and are cost effective due to commonality of parts. The 700-mm An automatic safety shutof f valve prevents overflows, while a relief valve limits internal drum pressure to 8 psig. Powered by compressed air with no moving par ts this quiet-running drum pump requires vir tually no maintenance, the company says. It is resistant to most non-volatile, non-flammable liquids, accommodating many industrial and commercial environments. A n o p t i o n a l k i t i n c l u d e s a l u m i n u m w a n d a n d squeegee spill pickup tool. ITW Vortec, call 800-441-7475 or visit vortec.com.